14th International Humority Hall Of Limeira 2018 Brazil..
Dear friends and artists, we are starting today the registrations for the 14th INTERNATIONAL HUMORITY HALL OF LIMEIRA with the support of the Municipality of Limeira, represented by the Secretary of Culture of Limeira. We would like to thank once again all those who collaborate and promote our event as our Secretary of Culture, Farid Zaine, who for another year gives us the honor of his partnership, as well as being part of our Judging Committee, a role that fits him well. which is geared towards the arts and for many years has also been contributing in this way. As well as Rodolfo Mereb Jr, Tutti, Martinho Colin Olivatto, who are fundamental partners for our achievement, among others. This year we also had the honor of having our Baptistão Poster, which gave us such attention and cordiality. With his talent, being the Master that he is, he contributed in a special way to the Limeira Humor Hall. Our special thanks go to Master Baptistão, who this year is also part of our Judging Commission, besides suggesting one of the themes for the production of the works. This example that we had of the great Master builds on what we always emphasize here, that a great artist is a great person, and knows how to contribute to the society in which he lives, making a difference. Another good news is that this year's trophies will be made again in surgical steel, which gives us great joy. All freehand artists are invited to participate. Registration is free. Participants can sign up with a maximum of 3 works of their own, from A4 (21 x 29.7cm) to A3 (29.7 x 42cm), ending their enrollment on August 14, 2018. For the works sent by mail is worth the date of the posting. All works must be UNIQUE and UNIQUE. If the rules are not respected the designs can not be selected and awarded. in JPEG in size A4 up to A3 with 300dpi. Digital is a freehand drawing and finishing. It is then scanned and sent through the e-mail along with the completed application form. Interart is a drawing built or finished with the aid of a computer with the direction of the artist that creates it. IS THE FAMILY INSTITUTION RISING? 1 (one) cash prize in the amount of R $ 1,400.00 (one thousand and four hundred reais) that will contemplate an artist for works sent as required by the regulation. 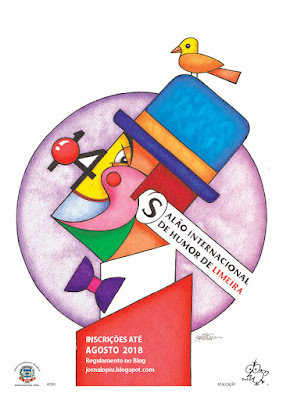 The selected works will be exhibited from September 6 to October 5, 2018, at the Palacete Levy, headquarters of the Municipal Culture Secretariat, in addition to the permanent virtual exhibition on the blog of Editora O PIU (www.jornalopiu.blospot.com), in addition to the exhibition promoted by the Limeira Culture Secretariat in points of the city. All entries will be considered acquisitive by Editora O PIU. Ownership, use and any other rights over these works will belong to Editora O PIU Ltda., Which reserves the right to make them the use that it deems appropriate. The simple registration automatically sets the participant's full agreement with this Regulation.